On the morning of July 12, precipitation stations in Bhaktapur recorded the highest amount of rainfall ever documented in the last decade. The intense rainfall that had started from Wednesday night had caused Hanumante River to swell up and flood like never before. Places like Jagati, Barahisthan, Radhe-Radhe and Thimi were engulfed in flood. The whole transport system was affected leaving local pedestrians and vehicles in total disarray. 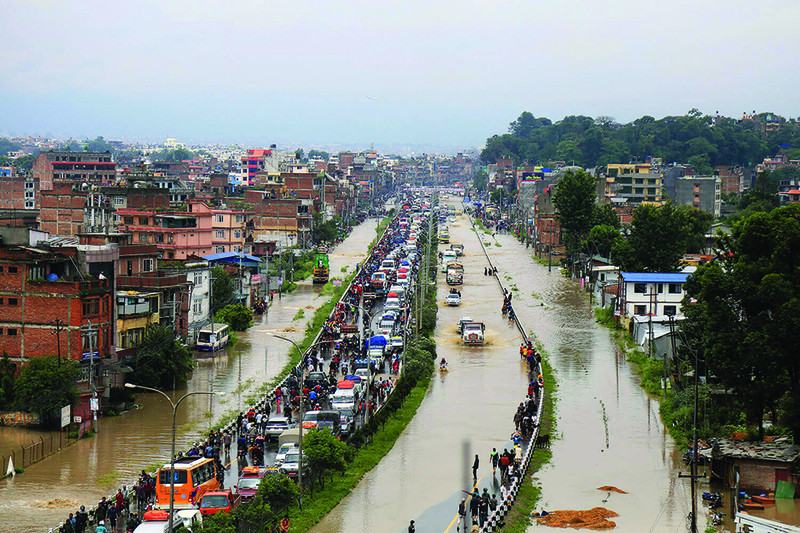 Flooding has become the major problem in Bhaktapur in the recent years. Including the most recent one, there have been two big flood events within the last four years, the first one occurring on August 27, 2015. Four precipitation stations have been installed in Changunarayan, Nangkhel, Nagarkot and Bhaktapur (near Suryabinayak) by Department of Hydrology and Meteorology (DHM). But there are no hydrological stations to measure water level and discharge within the watershed of Hanumante River. Flooding is not a new event for Bhaktapur. Inability to monitor it has remained a persistent problem. 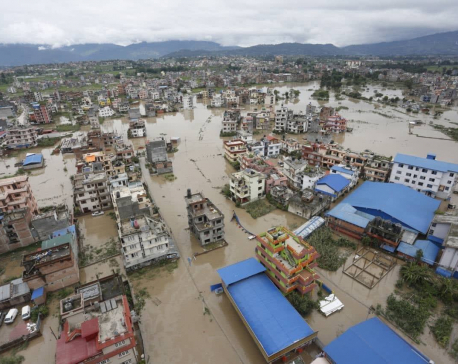 According to SmartPhones4water-Nepal (S4W-Nepal), which has been studying different climatic and hydrological factors in Nepal, different regions in Kathmandu valley, particularly Bhaktapur, had received over 100 mm of rainfall on Thursday. Based on the precipitation recorded by DHM stations and S4W-Nepal stations, a high rainfall pocket was observed in eastern region of Bhaktapur district. The pocket drains the water into Hanumante River. Except in Changunarayan, different precipitation stations have recorded over 100 mm of rainfall in Bhaktapur: Nagarkot (113 mm), Tathali (140 mm), Sipadol (135 mm), Bhaktapur Nagar (115 mm) and Thimi (113 mm). Both Thursday’s event and that of August 2015 was triggered by 10 hours long incessant rainfall. Although Bhaktapur and Madhyapur received less than 50mm rainfall in 2015, the surrounding landscapes of Hanumante stream were completely inundated. The intense rainfall in upstream headwater of Hanumante watershed had drained to the river. The highest rainfall ever recorded in Bhaktapur was in 1990 when there was 260 mm of rainfall. Over the last five decades, the average one-day extreme precipitation in Bhaktapur has been around 80 mm. In the year 2001, 2002, and 2015, there had been over 100 mm of rainfall in this region. High-intensity rainfall in a very short interval triggered water-induced hazards like floods and landslides. River water level and discharge increase with rainfall. This is normal. But not all rainfall causes flooding. It has become a burning issue these days owing to its increasing impact on the life of urban dwellers. They faced such situations in the past too, but impact used to be minimal. The traditional settlements of Newars did not have to bear with devastating impacts in the past because human settlement was concentrated on highlands and agriculture was concentrated on lowlands. So the flood didn’t reach the human settlement, but instead supplied nutrient-rich sediment to lowland floodplains. But the situation has changed drastically in the recent decades. Thousands of people enter the valley every year and they never leave the city of their dream. According to a study, 10,000 new houses are being built each year in the valley. If this rate continues, raindrop won’t infiltrate into the natural ground after 30 years. The population growth rate of Bhaktapur district is 2.96 percent. With this, land use pattern is also changing steadily. According to ICIMOD’s land-use map (see the figure below), more than 60 percent of agricultural land has been converted to haphazard settlement in the past three decades. While the government lags behind in implementing proper land use policy to control unbridled settlement, people’s desire to have at least a house in the valley turns all floodplains and agricultural field into unsafe human settlement. This has virtually turned the green beautiful city into the concrete jungle. According to Nawaraj Gelaal, Chief of District Coordination Committee Bhaktapur, the width of Hanumate stream used to be six to ten meters in 1964, now it has shrunk to two meters. As per the Department of Water Induced Disaster Management, Hanumante needs 50 meters width to pass flood. Constructing river corridors and constricting the stream width will be costly. Another cause of flooding in these streams is insufficient width and freeboard of bridges. This was witnessed at the bridge at Radhe-Radhe along Araniko Highway and another one near Siddhi Memorial Hospital. This is the situation in almost all the bridges. The land mafias are making the situation worse by land pooling, encroaching upon the streams and their waterway. Unplanned settlement without proper drainage has turned the area into a waterlogged area. We are threatening our own lives by encroaching upon natural waterway of rivers. We are inviting the disaster ourselves. To find the solutions of flooding we need to first find reasons of flooding. For this, we can delineate flood hazard zone at different return period of rainfall by incorporating hydro-meteorological data obtained from satellites and ground. It acts as one of the effective non-structural measures to mitigate the impact of water induced hazards. We can also develop a forecast based early flood warning system with appropriate lead time and develop a dissemination mechanism to the concerned authorities. Observations are important for this. Therefore it is very important to continuously acquire hydro-meteorological data by installing adequate numbers of stations. Department of Hydrology and Meteorology (DHM) has a major role to monitor all hydrological and meteorological activities in Nepal. There should be strong collaboration between central and local bodies to effectively design the network of stations. British scientist Lord Kelvin once said, “You cannot manage a resource, you don’t measure.” Data collection is one of the most important aspects of scientific research. Without good sets of a database, scientific research findings will not be reliable. The essence of hydro-meteorological data has more significance in a country like Nepal where water-induced hazards are more frequent. A limited number of hydro-meteorological stations installed by DHM will be insufficient to capture the local rainfall and river flow pattern. Even the satellite data are of limited resolution and they also cannot capture local weather and river features. DHM has failed to install a sufficient number of stations to capture local weather and river flow patterns probably due to lack of resources. This is where citizen science approach can be useful. It is one of the effective alternative ways to fulfil this data gap in both space and time for a common citizen can also contribute to the scientific research. For the last two years, SmartPhones4Water Nepal (S4W-Nepal) has been conducting research activities in the field of water resources in Kathmandu valley. It has been measuring rainfall in more than 50 stations, stream water level and the flow in 15 stations and groundwater level in 40 stations within the valley with the active involvement of more than 100 citizen scientists and young researchers. It has also started rainfall measurement in Pokhara, Hetauda, Dharan, and Biratnagar from this year. This innovative method should be expanded across the country. Since both the government and people are responsible for what happened in Bhaktapur both parties should be responsible for solving the problem. Central and province level government should immediately focus on preparing and strictly implementing proper land-use policy including land-use zoning, protecting the natural water way of streams and rivers and providing alternatives for refugee settlements in flood plains among others. Under federal setup, authority has been devolved to local levels. Thus it is not wise to rely on the central government and (DHM) for hydro-meteorological study. Local governments should put hydro-meteorological monitoring, early flood warning system and rescue and relief operations on top priority by collaborating with DHM and other government and non-government organizations. What will happen if 260 mm rainfall like that of 1990 occurs now? The situation will be more disastrous than we have imagined. The cities and roads may be waterlogged for days, depriving people of safe drinking water causing water related epidemics. Furthermore, if the 1993 equivalent cloudburst event happens again in Kathmandu valley with one day rainfall of around 540 mm, the extent of flooding and inundation would be unpredictable. We must do something to save our cities from floods. Time is running out.